Oh dear! 600 words reviewing my time as Chairman — where do I start? Actually, I don’t; instead I’ll pick out some personal highlights. There’s lots more on our website. Planning in the Conservation Area has always been an integral part of the Society’s remit. Closer relationships with the planners have helped to make the Society much more influential. We have helped with local and sometimes expert knowledge, we respond constructively and we only make a fuss when we think it is really necessary. In return, we are listened to and our input has impact. No, we haven’t won all our battles over the years, but we can take credit for many incremental improvements and for stopping a few eyesores. We have presented our awards every two years and they are greatly valued. Categories have included conservation and renovation, green projects and new builds. I particularly remember the green space on Church Lane: our award is still displayed there. The sundial on All Saints’ was certainly the hardest work, but a real favourite of mine is the cleaning up of the outside of the Bastion, now being maintained by St. Peter’s Community Group. We have also worked with local schools to inculcate a sense of pride in our town from an early age. 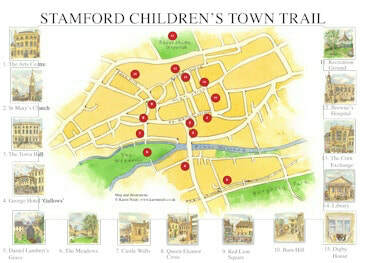 The Stamford Children’s Town Trail is a memorable example. The Urban Group became part of the Society in 2012. Its renovation of St. Michael’s Churchyard was a huge improvement in the town centre. Among many smaller projects, the recent work on the Albert Bridge stands out. In 2006, our website was unloved and poorly maintained. It has been hugely extended and it is now a proper ‘shop window’ for the Society, though there is still room for improvement in our social media presence. We have installed two blue plaques and four more information boards in the town since 2007. Nearly every time I walk past St. Michael’s Churchyard, somebody is reading our board. Very satisfying! Our bi-monthly newsletter was started in 2013; it has been an excellent way of keeping members up to date. 2018 will see the printing of our fifth Annual Review; the high quality of these publications is confirmed by a recent request for copies from the copyright libraries, reflecting great credit on our editors and contributors. While the Society has a serious purpose, that does not exclude having fun. The website lists almost 100 events in my time as Chairman: the variety is amazing. Two very different talks stand out for me: David Ellis on Collyweston slate, especially his pictures of working conditions in the 1960s; and Elizabeth Inman on what it takes to put on the Burghley Horse Trials. 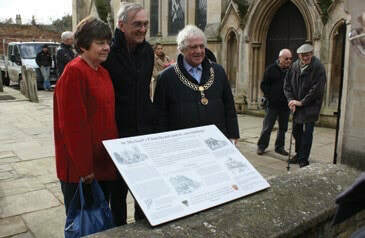 Our celebration of the 50th anniversary of Stamford becoming the first Conservation Area is a happy memory. I have been delighted to see our summer party at St. Leonard’s Priory so well attended every year. I hope the next Chairman has as much luck in keeping the rain away! Anything that we have achieved has been a group effort, with major contributions of time and expertise from committee members, the planning subcommittee and the urban group, not forgetting Orlando Rock, who became President when I became Chairman. Without all of them and our members, we wouldn’t be here today.